“I buy into the approach you describe, but that is not what I buy from suppliers,” one Managing Director told me in the early 1990s. At the time the world of organisational development was awash with theories. Many of these were based on common sense. Leaders need to implement the right strategy with the right people in the right way. That sounds simple, but how do you translate it into action and deliver success? Going back further, much of my own work from the 1970s onwards was devoted to helping people to build on their strengths. This often focused on how they could do satisfying work and achieve their picture of success. Looking back on your own life, when have you helped people – a person, team or organisation – to move beyond philosophy? When have you helped them to translate certain principles into practical application? People obviously had to be self-motivated – they needed to have the will before developing the skill. 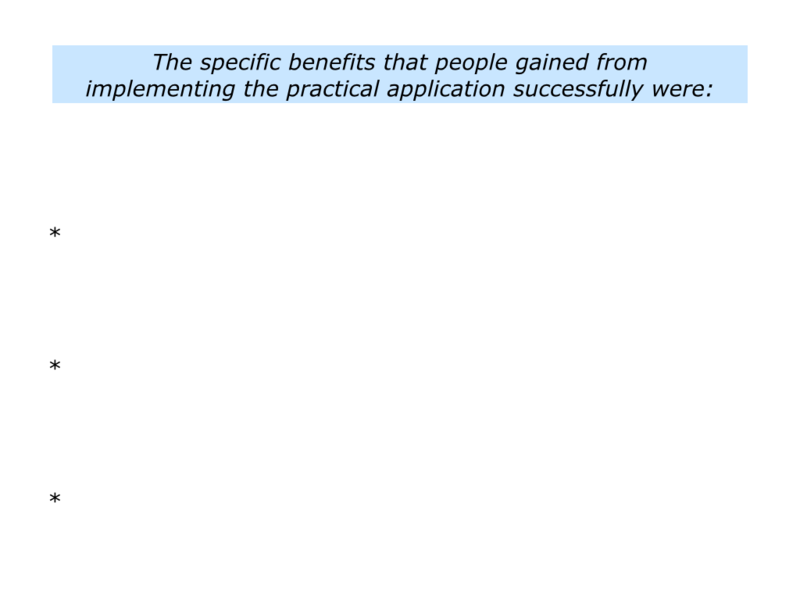 They would also have done the implementation themselves, but how did you help them to make this happen? Describe a specific situation when you helped people – a person, team or organisation – to implement the practical application successfully. 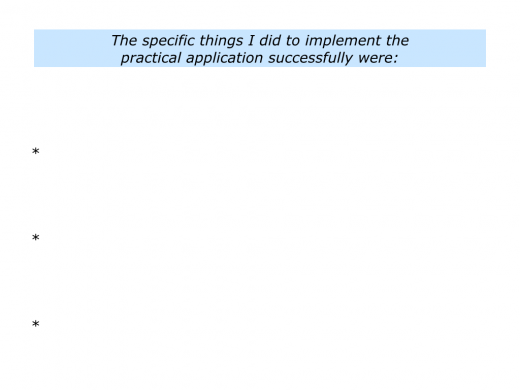 Describe the specific things you did to help people to implement the practical application successfully. Describe the specific benefits that people gained from implementing the practical application successfully. 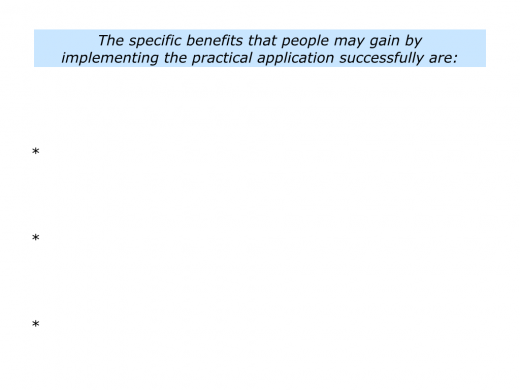 So how can you help people with practical application? One approach is to study, simplify and share what works. Several of my mentors encouraged me to take this approach during the late 1960s. At the time I was working in therapeutic communities. One of the key philosophies around then was Let A Hundred Flowers Bloom. This also applied to supporting different approaches to working with people. 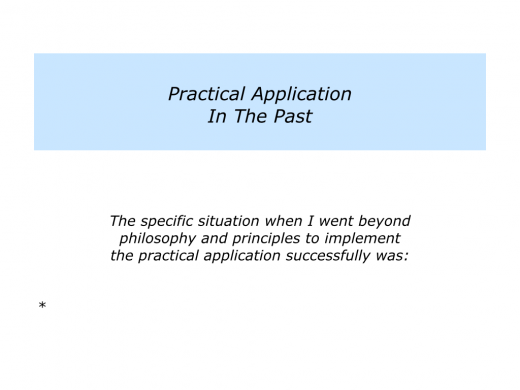 I believed in encouraging many different philosophies and principles – providing they did not hurt people – but my work also involved being extremely practical. Looking at the various ways of working with troubled young people, for example, what actually worked? It was suggested that I look around the world and study successful programmes. Many therapies sounded appealing, but which had a track record of success? 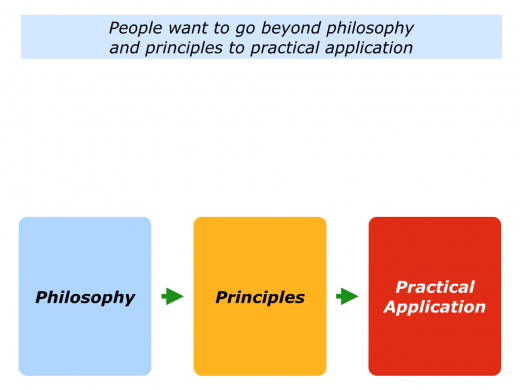 What were the philosophies and principles they were following? Most of all, how were these translated into practical application? This was the key. It was vital to focus on what people actually did to achieve their goals. Lots of people talked about concepts, but it was helpful to study how these were translated into concrete actions. Looking at the therapists, for example, what did they actually do to create the right environment and then help people to shape their futures? Looking at the people who were coming for help, what did they actually do to take charge of shaping their futures? Later on I began working with individuals, teams and organisations. It was then useful to study people who were doing satisfying work, building super teams and achieving peak performance. Studying success makes sense, but then how can you pass on the information? 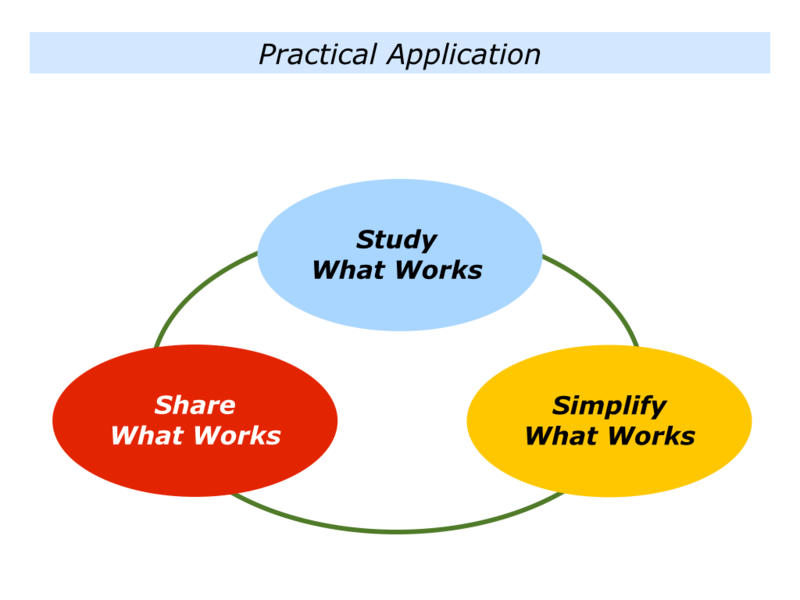 Good educators often simplify – in a profound way – what works. They then share what works in a way that people can use in their daily lives and work. Such educators start by focusing on a specific activity they find fascinating. They may also have a feeling for the activity and the ability to see patterns. Pattern recognition is one of the keys to identifying and, if appropriate, delivering peak performance. Educators often take the following steps when studying and simplifying knowledge in a particular field. They focus on what people do right – the successful patterns they follow – to succeed. They translate these patterns into principles that people can follow to succeed. They provide practical tools that people can use to follow these principles in their own ways to succeed. Let’s assume you have studied and simplified what works in a particular field. Many people have experience, knowledge and wisdom. But then comes another question. How to pass on the knowledge in the way that helps people to succeed? Good educators watch people, teams or organisations in action – or they study examples of their work. They then ask themselves some of the following questions before sharing ideas. What are people’s goals? What are the real results they want to achieve? What is their picture of success? Let’s take a reality check about what is happening at the moment. What are people doing well? How can they do more of these things in the future? What can people do better and how? How can people build on their strengths? How can they build on where they deliver As and manage the consequences of their Bs and Cs? How can they apply their own and other people’s strengths to give themselves the greatest chance of success? How can people build on what works? Looking back, when have people tackled similar challenges successfully? What did they do right then? How can they follow these principles – plus maybe add other skills – to achieve success? Looking around the world, who else has tackled similar challenges successfully? What did they do right then? How can people learn from these approaches and apply the ideas in their own ways? How can people move forwards? What are the three key strategies they can follow to give themselves the greatest chance of success? 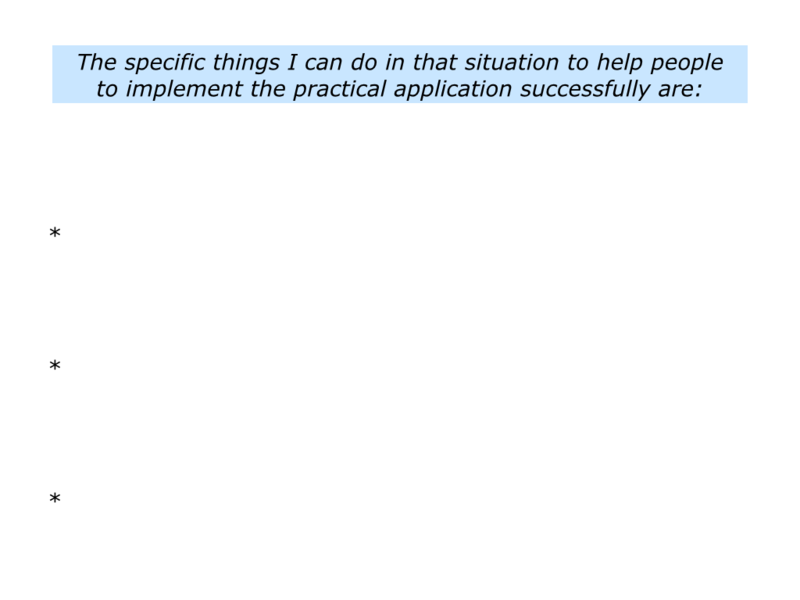 How can they translate these into practical application? Bearing all these things in mind, how can I help people to achieve their goals? What are the key messages I want to give them? What are the positive models and practical tools I can share? How can I pass on this knowledge in a way people can use? How can I encourage the organic approach to development? How can I help people to develop the seeds they already have within them? How can I help them to build on their strengths and successful patterns? How can I help them to integrate ideas they have learned from other people? 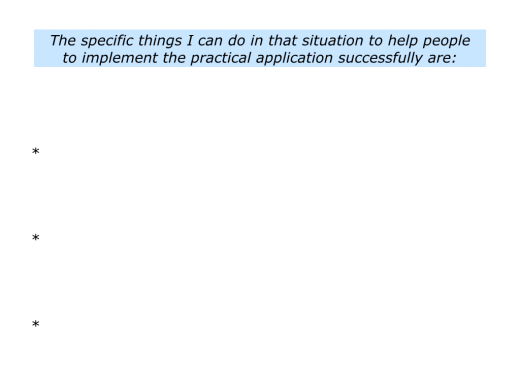 How can I help people to create an action plan they believe in? How can I help them to translate this into practical application? How can I help them to get some quick successes? How can I encourage people on the journey? How can I help them to keep doing a reality check? How can I help them to build on what is working? How can help them to find solutions to challenges? How can I help them to achieve ongoing success? 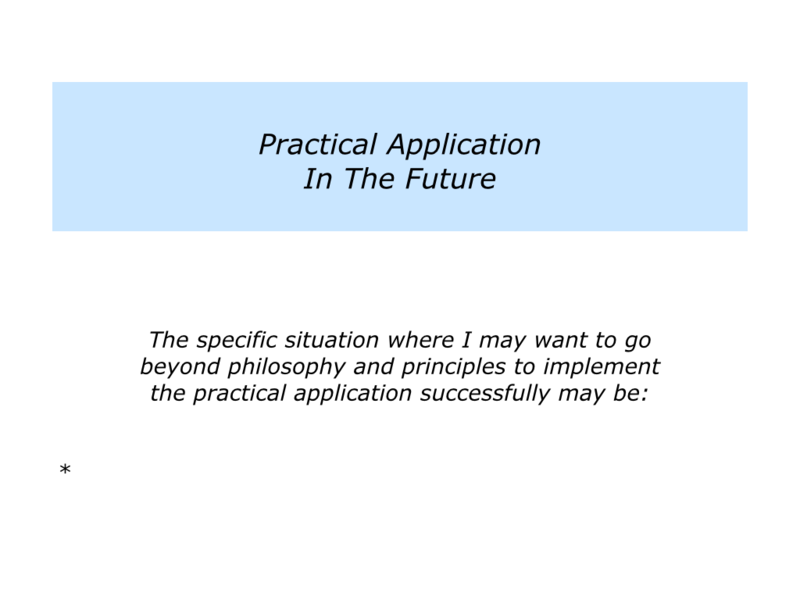 You will, of course, have your own way of helping people to focus on practical application. If you wish, however, try tackling the exercise on this theme. This invites you to do the following things. 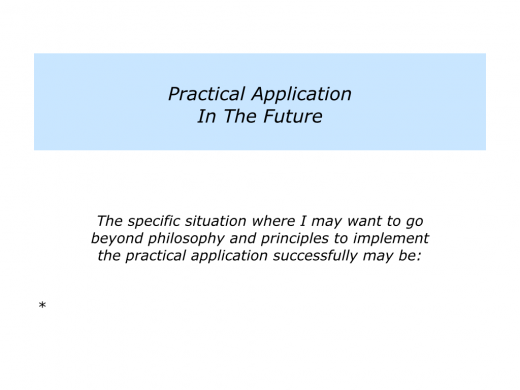 Describe a specific situation in the future where you may want to help people to implement the practical application successfully. 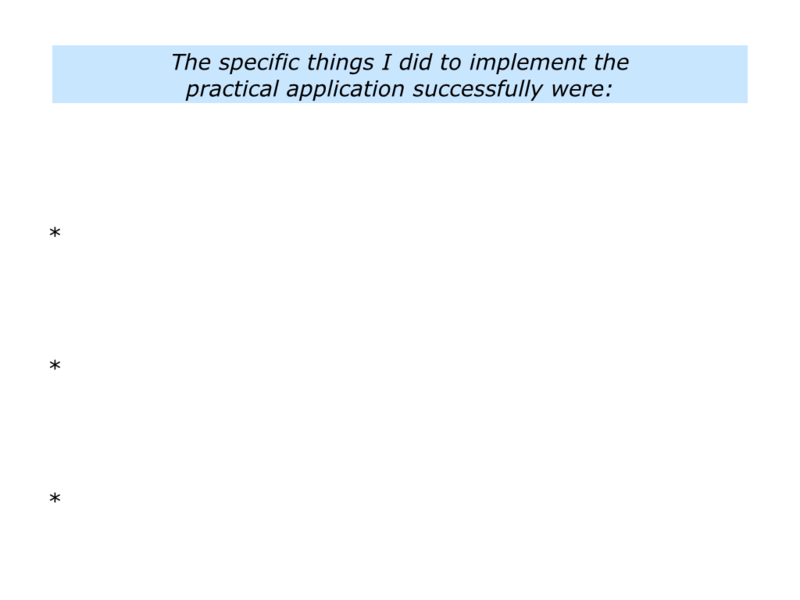 Describe the specific things you can do to help people to implement the practical application successfully. 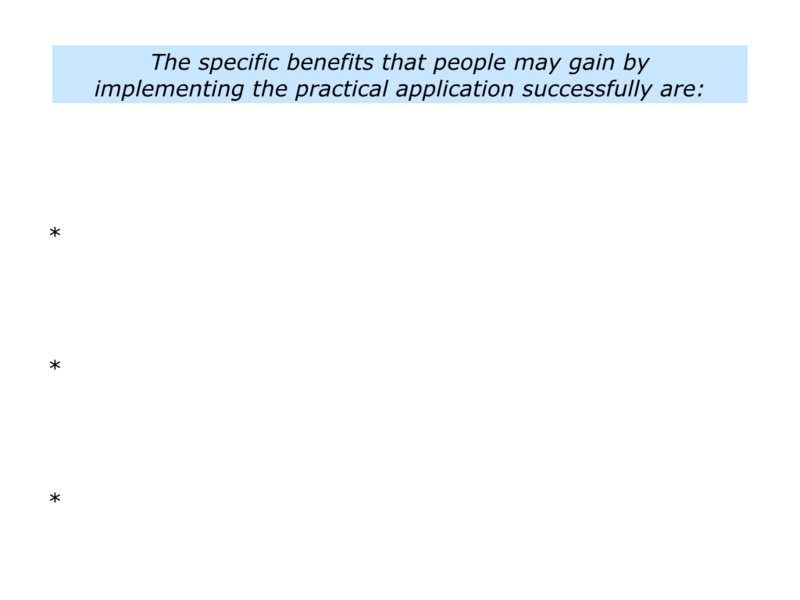 Describe the specific benefits that people may gain from implementing the practical action successfully.